Manage your FIFA World Cup 2018 Panini sticker collection! Sticker Tracker helps you track your sticker collection and allows you to keep an overview of collected and missing stickers. 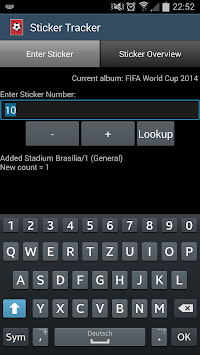 Stickers can be entered via sticker number or by using the overview page to click-add stickers. 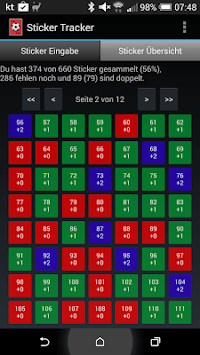 The application will automatically calculate the number of missing stickers as well as the duplicate stickers you have. This information is also exportable and can be sent via e-mail to other collectors. 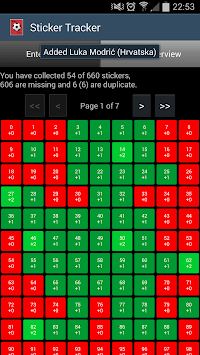 Q: I see missing sticker numbers / sticker count only goes up to X? A: Try re-installing / a fresh install and wait a few moments after first start up to let it initialize the database. Q: How can I reduce the sticker count for a number? A: Long click on the sticker's button to reduce the count by one. Q: What are the sticker numbers P1-P20 for? A: For the stickers of the poster (only available in selected countries). Q: Will I loose existing data when updating? A: No, all your current album stats will be retained, you can switch between albums easily.